In my last post I asked whether you’ve ever squeezed more out of a headhunter… Did you ever successfully negotiate a higher job offer via a headhunter? 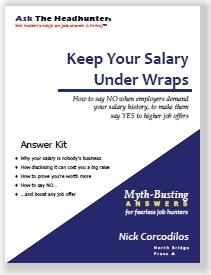 Now I’m going to do something I’ve never done before on this blog, on my web site, or in the Ask The Headhunter newsletter… I’m going to plug a new Ask The Headhunter product… and save you ten bucks because you read about it here first. I’ll give you a discount code in a minute… worth $10 off. Everything on all the Ask The Headhunter “channels” has always been free (for over 12 years) — articles, blog posts, tweets, tips, newsletters. (Ah, no sweat — you’re welcome. Thank you for helping me keep it interesting!) I hope it’s kept you ahead of your competition. But it’s also kept me limited to short pieces. So I decided to break the word-count meter and actually pack all I could into one big topic: How to Work with Headhunters… and how to make headhunters work for you. 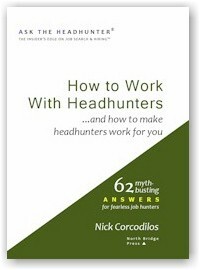 I filled it with almost everything I know about how you can work with, deal with and profit from headhunters. (I say almost because I’m sure that if you read it, you’ll come back here with questions that will make me realize there’s always something more I can teach you… So we’ll be covering more.) 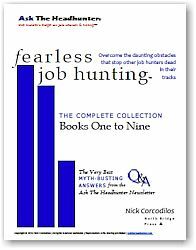 I also expose all those unsavory characters who call themselves headhunters but waste your time and make you feel worse than the HR machine does when it chews you up and spits you out… When you’re done reading, you’ll never waste a minute with them again. What about how to squeeze a headhunter for a higher job offer? It’s in there. No one else has ever told you how to do it quite like this before… How to really qualify a headhunter? It’s in there. 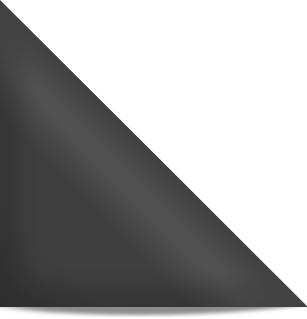 What kind of resume is best at making you the headhunter’s #1 candidate? It’s in there. A crib sheet? It’s in there. I had a blast writing every page. You can learn more about it and decide whether it’s for you by clicking the book cover above: Features, benefits, sample pages, the table of contents and so on. About the ten bucks: If you’ve been following Ask The Headhunter all these years, you can get the edge first and get it for $10 less than the rest of the world by using this discount code when you order (I’ll leave the code active for a reasonable period of time). About those 62 questions I answer in the guide: I’m ready to answer more once you use those up. Your new book might be the best one ever. Seriously. 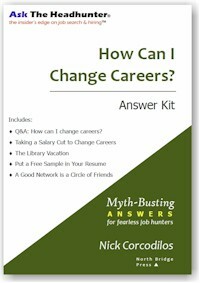 Everyone job seeking should read this…or everyone who THINKS they might be job hunting in the future.